As a way to support the local community, we’ve developed a program in our Ann Arbor office called AdWords in the Curriculum. In the course, Michigan high school and college students learn the ins and outs of Google AdWords. We hope graduates of the course, armed with a new set of skills, will go forth and help Michigan’s companies succeed in a global, technology-based economy. “What does this all have to do with me?” you may be asking. In AdWords in the Curriculum, students are assigned local Google Grantees. They work together to apply the students’ new knowledge and implement strategies. But because most of you don’t necessarily have time to take a class and spend a lot of time experimenting with AdWords accounts, we thought we’d set you up with regular check-ins from the AdWords in the Curriculum students. We want to share their learnings, so that we can all make the most of their newfound experience, and spend advertising dollars wisely. We'll be rounding up their learnings on a monthly basis here on the blog, so we hope you'll check back in to see what's new in the world of AdWords for non-profits. To tide you over until the first official check-in, we'll leave you with a quick tip from one AdWords in the Curriculum alumni: Know your audience. Eastern Michigan University students working with Dawn Farm, a rehab facility, initially targeted drug users looking for help. But when their ads weren't appearing often at all, they soon realized that it's not the addicts themselves looking -- they, of course, don't always realize they need help. Rather, it was loved ones searching, and researching drug effects. So, the students added keywords like 'LSD symptoms' and 'crack effects.' They also wrote ads targeted more toward loved ones, highlighting the informational portions of the site. Traffic to the site rose by 60 percent. In this video from Eastern Michigan University's College of Business, an AdWords in the Curriculum professor interviews one of the students about her experience with the Dawn Farms account. Nationwide, belts are tightening. And in Michigan — home of the auto industry — belts are on just about the tightest holes. If you’re looking to track a specific action on your website, conversion tracking is a great way to do this. Conversion tracking begins when a user clicks on your ad, and then if the user reaches your conversion page (typically a ‘thank you’ page), the conversion will be recorded in your account. Once you input your account’s conversion tracking code, you’ll notice new columns appear on the Campaign Summary page. These columns will report conversion data. When setting up tracking, you’ll be able to indicate the action you’re tracking as a Purchase, Lead, Signup, Pageview, and Other. Instructions on implementing conversion tracking can be found in the AdWords Help Center and in the Learning Center. One important thing to note is that you’ll have to edit the code on your website to get started, so make sure that your webmaster is available to make these fairly simple changes to your website’s code. After conversion tracking is set up and you begin to accrue data, you may also want to run a Keyword Performance report and even customize the columns to focus on conversion data. This previous post provides helpful information on running reports. Ultimately, conversion tracking can help you determine how to most effectively use your Grant. You might find that one ad group drives the majority of your conversions, which could indicate that your Grant could be used more effectively if other ad groups were paused. Also, you may notice that certain keywords drive up your campaign’s cost without resulting in conversions. In this case, you may want to consider pausing those keywords in order to permit the keywords that result in conversions to run more frequently. Whatever your campaign’s purpose may be, conversion tracking may potentially increase your campaign’s success. Now that Google Grants is directing users to your website, is there a specific action you’re looking for them to take? For example, is the purpose of your Grants campaign to collect donations? Or perhaps have them sign up for your newsletter? Whatever the action may be, conversion tracking can provide data about your campaign’s effectiveness. And you can get data regarding those actions on your website directly in your Grants accounts. The session also covered Google Analytics installation, goal setting, interpreting reports, troubleshooting, and more. Check out the slides from the session here and purchase the audio recording on NTEN's site if you are interested in learning more. To find out more about the series and register for this final session, please visit NTEN's site. And if you're in the San Francisco Bay Area this weekend and you'd like to speak with a Grants representative, visit our booth at the Craigslist Foundation Bootcamp this Saturday, October 18. In last week's NTEN webinar, we discussed managing multiple campaigns in your Grants account. One of our knowledgeable Google volunteers, Lisa, shared valuable information on this topic; such as solid account structure, when to use one campaign versus multiple ones, setting up new campaigns, managing multiple campaigns, and managing a paid AdWords account with a Grants account. 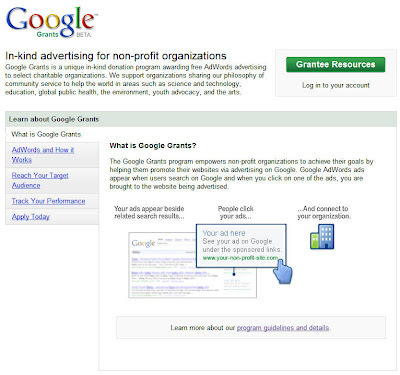 This last point was new information for many of you, as some mistakenly thought that non-profits cannot have both a Grants account and a paid AdWords account. In fact, we have a handful of organizations that have both types. We discussed details about these types of campaigns, including examples and benefits of multiple campaigns for each reason. If you missed the session, you can view slides here and also purchase the webinar recording on NTEN's site. The final session in our 5-part series is this Friday, October 17, from 11 a.m. to 12:30 p.m. Pacific time. We'll focus on evaluating AdWords performance through your Grants account and Google Analytics. , we introduced you to another great non-profit resource: our YouTube Nonprofit Program. Since then, thousands of you -- from the Smithsonian Museum and the Alliance for Climate Protection to the New York Public Library and the Children's Defense Fund -- have joined the program and started using YouTube to raise awareness about important issues, fundraise for causes, and engage with supporters. We still get a lot of questions, however, about how organizations can best leverage YouTube to spread their messages. To help answer those questions, we've created tip sheets specifically for non-profits in mind. Whether you're operating on a shoestring budget, looking to launch a video campaign, or just need some basic pointers, we've got you covered. You can access them from our YouTube Nonprofit Program page. In addition, we've posted the first in what we hope is a series of YouTube non-profit case studies. Our first video features Tim Fullerton, the Online Communications Manager at Oxfam America, who discusses how Oxfam used YouTube to start a fruitful discussion with Starbucks about fair wages for Ethiopian coffee farmers. If your organization is using YouTube in a particularly compelling or unique way, please let us know -- our next video could be about your work! And if you're looking for a little more inspiration, you can always visit the YouTube AgentChange channel, which features monthly playlists of our most interesting non-profit content. Finally, we always welcome feedback. If there are other things you think we could do to help non-profits create meaningful social change through YouTube, please email agentchange@youtube.com. Back in April, we introduced you to another great non-profit resource: our YouTube Nonprofit Program. Since then, thousands of you -- from the Smithsonian Museum and the Alliance for Climate Protection to the New York Public Library and the Children's Defense Fund -- have joined the program and started using YouTube to raise awareness about important issues, fundraise for causes, and engage with supporters. As you peruse the Help Center or check out other information about Google Grants, you'll likely notice our new look. After five years, we're redesigning our website to be more useful for grant recipients and those new to Google Grants. We've made more resources and information easily available, and we've organized it in a more user-friendly way. Right now we're only testing the new look in the U.S., but we're using this test as a chance to launch the new site to all of our visitors very soon. We hope you'll take a stroll through the site and experience the changes we're making in an effort to improve your experience with our program. If you see something on the site that you'd like to discuss, visit the Google Grants Help Group and join the conversation. If you come across resources that would be useful to the greater non-profit community, feel free to post it to the appropriate topic in our Help Group so that everyone can benefit. If there are some resources you'd like to see featured in these round-ups, let us know. If you'd like to review previous round-ups, just search for "Resource round-up" from the search box at the top right of the page. Our resource round-up for October features Google news, training webinars and a third-party perspective on applying for a Google Grant. Use a "call to action" such as 'donate,' 'sign up,' or 'get involved.' It tells people what you want them to do! Using these best practices, especially testing and monitoring ad performance, can have a huge effect on your AdWords account: drawing in more interested visitors through your ads will likely contribute to more conversions (volunteers, donations, and so on) on your site. If you couldn't attend last Friday's webinar, you can view Beth's slides here and buy the audio recording from NTEN. We'll be taking a short break from the webinar series this week, with our next installment on Friday, October 10, from 11 a.m. to 12:30 p.m. Pacific Time. In this session, we'll discuss managing multiple campaigns in your Grants account, why that may be a good option for your organization, and best practices for optimum performance. We'll also cover how to manage both a Grants account and a paid AdWords account, should your organization have the need to run both. Hope you can join us! To register for or learn more about our 5-part webinar series, please visit NTEN.